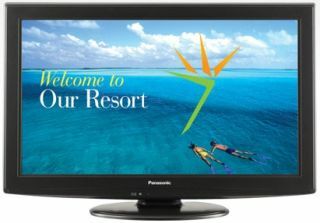 Three models from Panasonic’s new line of hospitality HDTVs - 32” TH-32LRU60, 39” TH-39LRU60 and 42” TH-42LRU60 - were distinguished as the Most Efficient ENERGY STAR qualified products in 2013. Products that are recognized in this way are designed to prevent greenhouse gas emissions by meeting rigorous energy efficiency performance levels set by the U.S. Environmental Protection Agency. With energy-saving technology top of mind in the hospitality industry, Panasonic designed the LRU60 Series with functions that reduce power consumption while ensuring performance. The LRU60 Series lineup consumes up to 20 percent less power than similar competitive LED TVs, and up to 50 percent less power than previous Panasonic CCFL LCD models. Energy-saving features include a built-in ambient light sensor feature called C.A.T.S. (Contrast Automatic Tracking System) that automatically adjusts the television's screen brightness and contrast to suit the lighting of the room, and helps to lower power consumption overall. The LRU60 Series has a sleek bezel design that gives the guest the appearance of more screen without taking up more counter space. The TVs are equipped with built-in invisible speakers and a rotating lock stand. They also include a built-in Pro:Idiom digital tuner for Pay-Per-View and Free-to-Guest programming support, and an integrated b-LAN terminal adaptor, eliminating the need for additional external boxes and decreasing the number of cable connections.